Mitigate risks from frequent application upgrades and complex SAP configurations with dynamic test automation. Maintaining SAP applications can be a painstaking, grueling task due to the complex workflows and architectures its ERP systems support that are intimately intertwined with critical business processes. Testing SAP applications from SAP S/4HANA to SAP CRM demand the support of cross-functional technology and business teams to protect to its stability and security that organizations depend on. Keeping up to date with upgrades to SAP technologies and custom configurations that could impact countless teams, millions of customers, and terabytes of data requires a faster, reliable solution. Manual testing is not enough to reliably support the ever-changing architecture behind SAP technology features, updates, enhancements, and configurations. Traditional testing tools require manual effort by highly skilled and technical test automation engineers to successfully take advantage and scale test automation for SAP applications. TestComplete has a hybrid object recognition with Artificial Intelligence that avoids the common pitfalls found with SAP testing, regardless of skill level. TestComplete comes with a powerful hybrid object recognition engine using property-based and AI-powered visual recognition to detect and test web, desktop, and mobile-based SAP applications quickly and reliably. TestComplete appeals to all SAP testers. Testers have the flexibility to script in different languages or to create complex automated GUI tests with scriptless functionality through record and playback, keyword-driven, or data-driven testing frameworks, regardless of skill level. TestComplete allows you to retrieve data from external sources such as excel worksheets, csv files, or database tables and separate test data from test steps to ease maintenance and expand test coverage across your SAP applications. TestComplete enables you to easily reuse components for efficient automation of an end-to-end business workflow including SAP and non-SAP applications. You can define modules based on functionality, the SAP application you are testing, or the business workflow you are looking to improve. You can orchestrate these tests through a test management tool such as QAComplete or HP ALM, or through a continuous integration tool such as Jenkins. 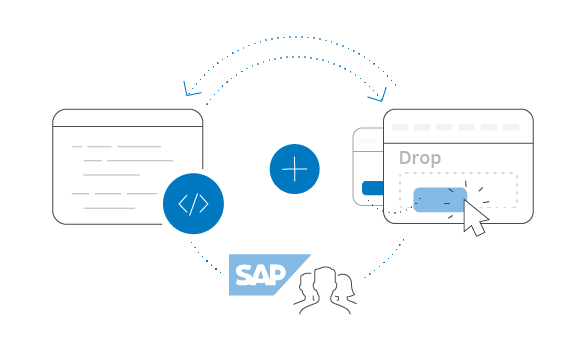 Our open platform will fit seamlessly in your SAP ecosystem.